If any firearm could be said to be overlooked, it’s the defensive shotgun. While not a tool for the inexperienced, it must be acknowledged that the shotgun loaded with a defensively-appropriate shell (preferably in the buckshot category) is a force to be reckoned with. 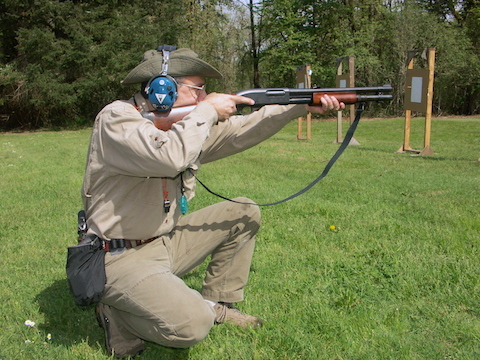 As a tool for self defense, the shotgun remains an effective choice. Back in the ‘90s the defensive shotgun was in its heyday. That’s when most of the accessories for (and dogma about) the shotgun were developed. In fact, there really hasn’t been a lot of evolution in the shotgun since then, save perhaps for the advent of the red-dot sight. That’s actually just fine with me, because I’ve come to regard most accessories for the shotgun as detrimental to its function and at odds with its application. I no longer recommend, for instance, extended magazine tubes or sidesaddle shell carriers. Ghost ring sights? Well, if you must, but I find the old-fashioned double bead to be more than adequate for the task of self defense at shotgun ranges. One thing that the “cool kids” did back then, and still do today, was to send their barrel out to a shotgun specialist to have some modifications made. The first is having the forcing cone lengthened. This modification smooths out the transition between the chamber and the barrel bore, which slightly reduces felt recoil. For an avid shotgunner, it makes the gun a little easier to live with on the range. It’s a nice, though not essential, modification. The second modification is to have the barrel backbored — honed to increase the internal diameter to just before the muzzle. People swear by this modification, though others swear at it. I’m one of the latter, because I’ve had mixed results with backbored barrels. Sometimes they result in a tighter, more cohesive pattern at typical defensive distances, but other times they don’t. One thing that they definitely do, nearly all the time, is make the gun very sensitive to ammunition variations. That’s where I part company with the practice; I don’t want to pay good money to make my gun more picky about what it shoots well! Some years ago I hit on the idea of installing interchangeable chokes, aka choke tubes, on my defensive shotgun. Interchangeable chokes are factory installed (and virtually a necessity) on long-barreled hunting and sporting guns, but for some reason the training world forgot about them in their zeal to make the shotgun more “tactical”. So did the manufacturers, because I can’t think of any short-barreled shotguns aimed at the self defense market that come from the factory threaded for tubes. It’s a shame that the lowly choke tube has been ignored in the self defense world, because it’s designed to do exactly what we want: control the shot pattern. Instead of painstakingly testing load after load to get the one which patterns just right, just change choke tubes! It’s easy to find the choke which makes the shot pattern perfect at whatever distance you expect to shoot, with whatever load you can get at your local sporting goods stores. Today, when people ask me about shotgun modifications, my first (and often only) recommendation is usually to have the barrel threaded for interchangeable chokes. They may be old-fashioned and not at all “tacticool”, but guess what? They work! P.S. : I’ve got two open enrollment Threat Centered Revolver classes coming up this fall! One will be in the Peoria, IL area and the other is in my usual haunt of Phoenix, AZ. Registration links coming soon! Hey Buddy!, I found this information for you: "Interchangeable chokes for defensive shotguns? Why not!". Here is the website link: http://www.grantcunningham.com/2018/08/interchangeable-chokes-for-defensive-shotguns-why-not/. Thank you.